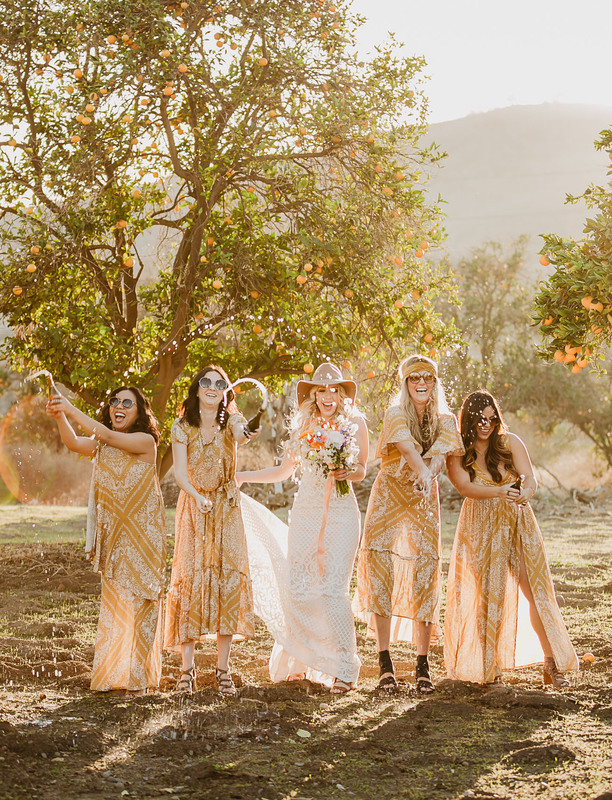 Hey there, flower child! Now is the time to put on “Here Comes the Sun,” or your favorite late ‘60s, early ‘70s playlist. Ready? Let’s dive in! 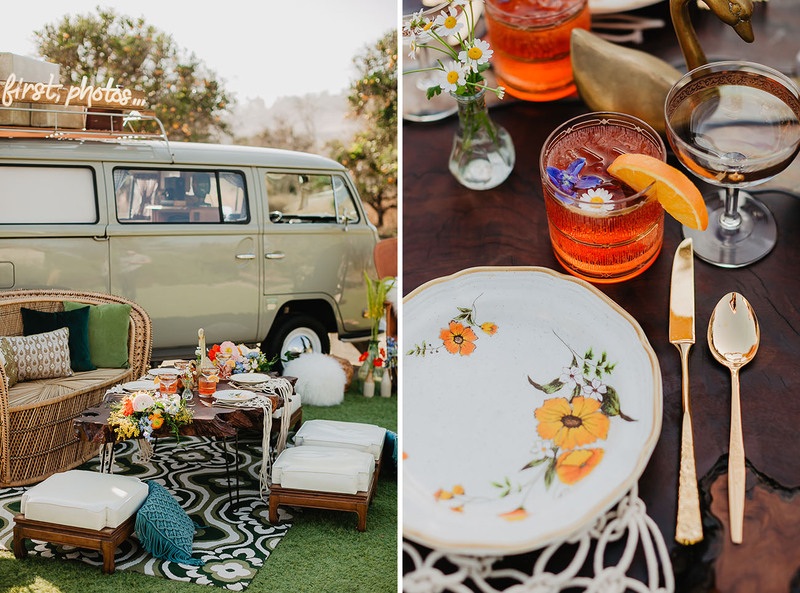 Some might say that the ’70s are very much still alive, especially in Southern California. 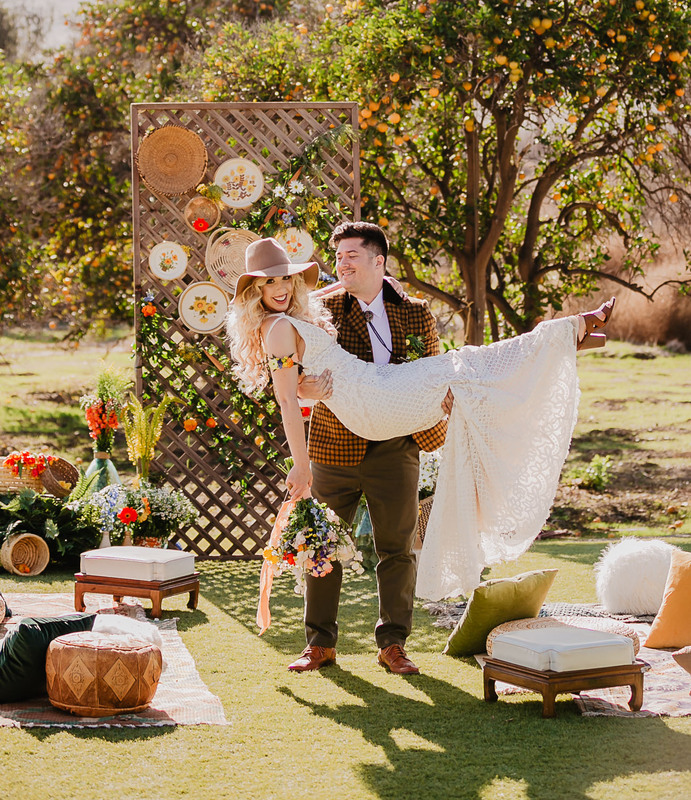 Event designer, Ashley of Monge Amore Events, definitely believes that! 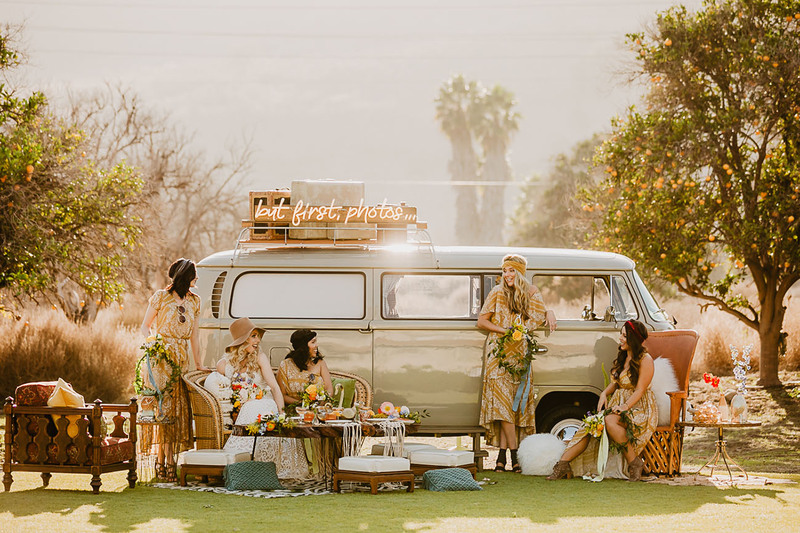 She shares: From the VW vans you see parked along the beaches, to the long beachy hair and laid-back attitude, Southern California still embodies that ’70s spirit. 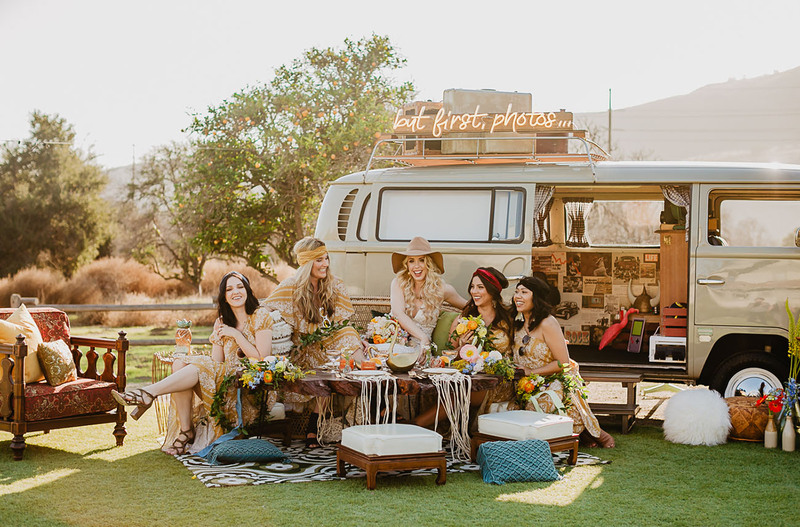 We love what that era represents: love, positive vibes, oh yeah… and some incredible free-spirited fashion! 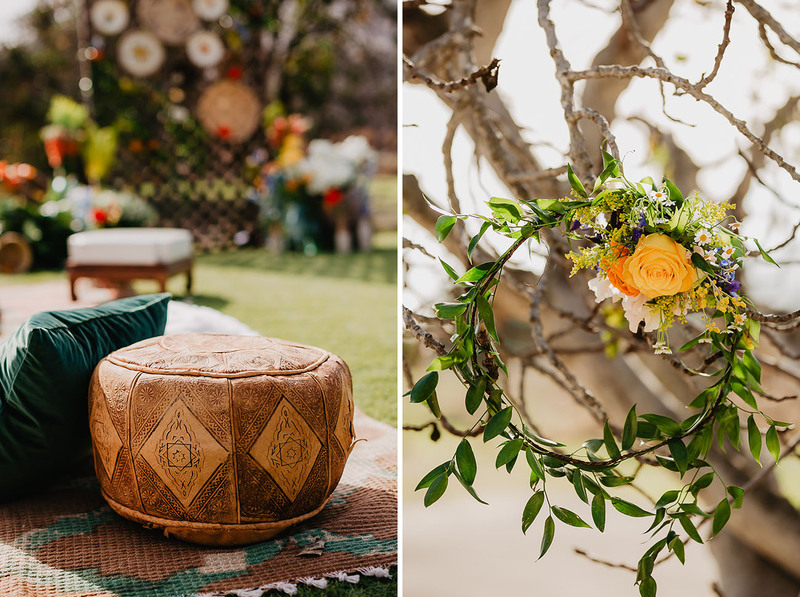 Coming to you by way of San Juan Capistrano’s historic farmhouse venue, A Stone’s Throw, this ’70s-inspired wedding pulls its palette + theme from the flower child movement and Southern California’s endless summer weather. 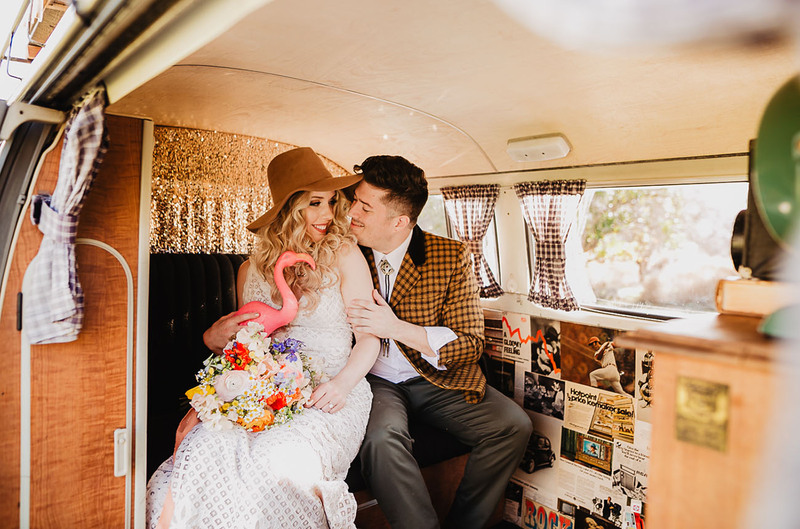 Let’s take a trip down memory lane in the photos captured by Sarah Mack Photo! 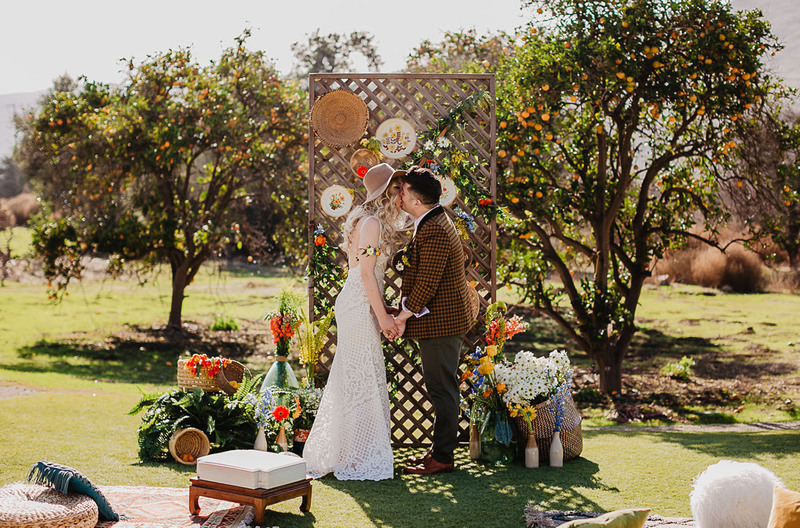 Hello FLORALS!! 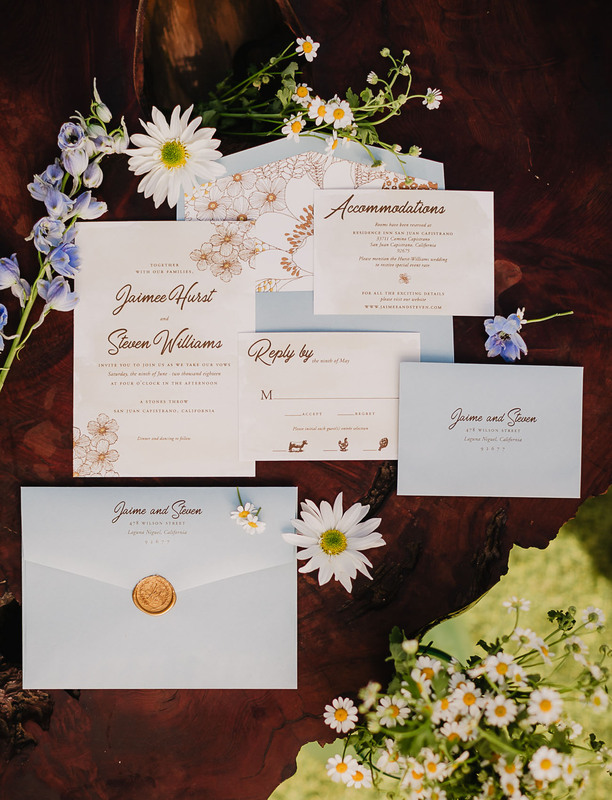 We’re dazzled by the daisy design of this invitation suite, crafted by Jen Simpson Design! 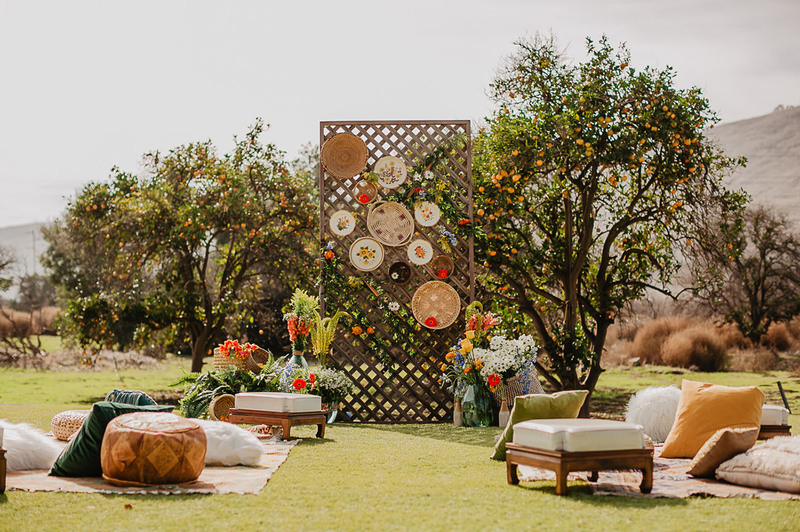 Framed by Valencia orange trees, the ceremony space was decked with groovy furniture pieces from Sundrop Vintage. 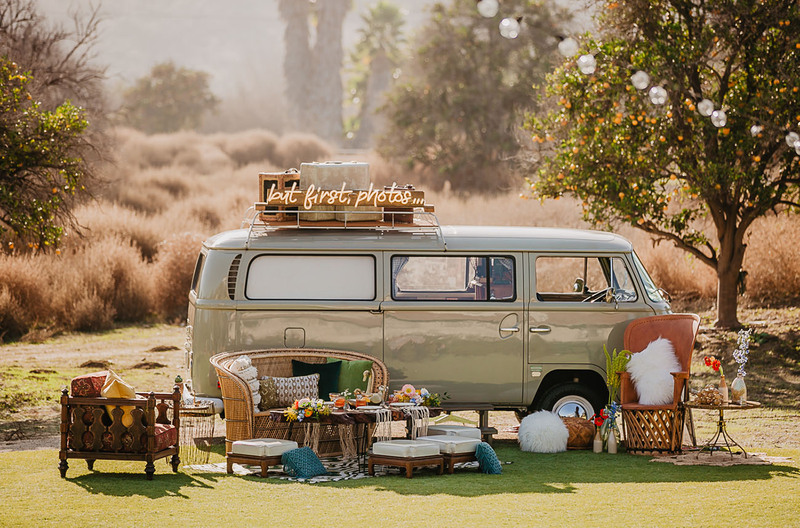 How much fun are those hanging plates in the background?! 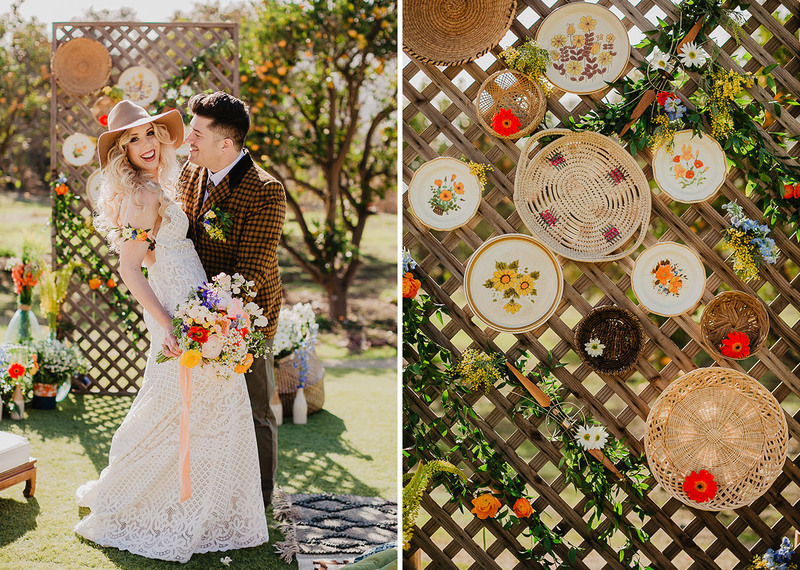 Such a fun tie in, especially since they’re used in the tablescape, too! 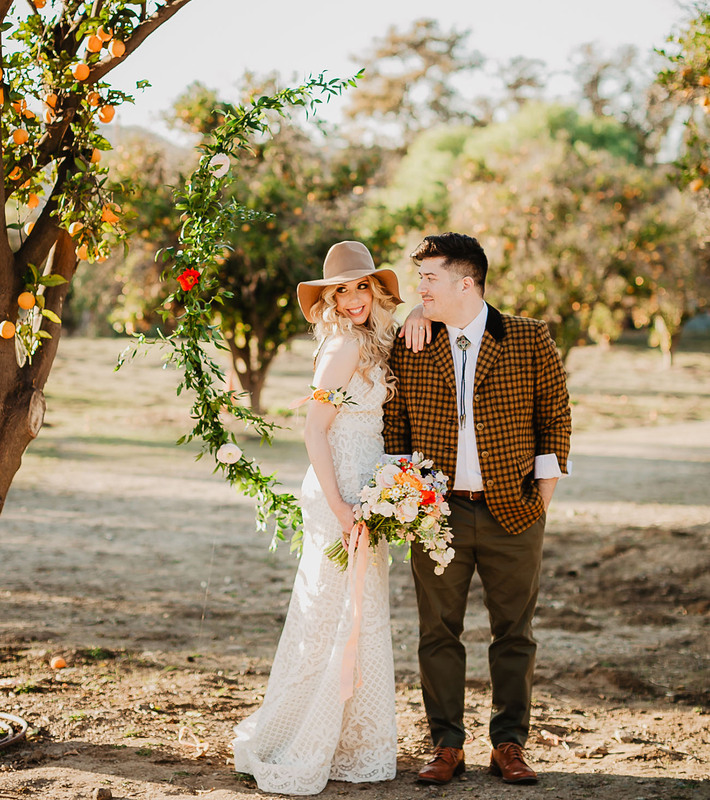 THAT DRESS. 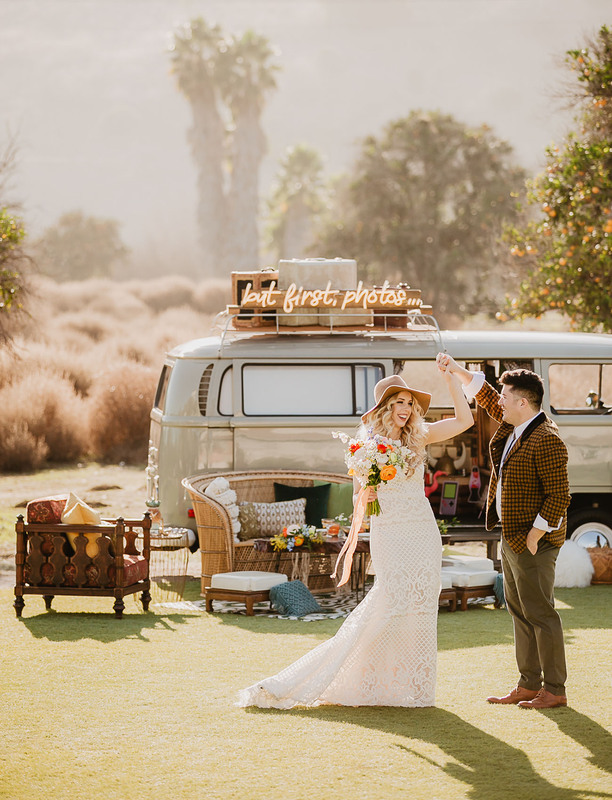 We’re all about the lace details of this Tara Keely wonder from Mary Me Bridal. 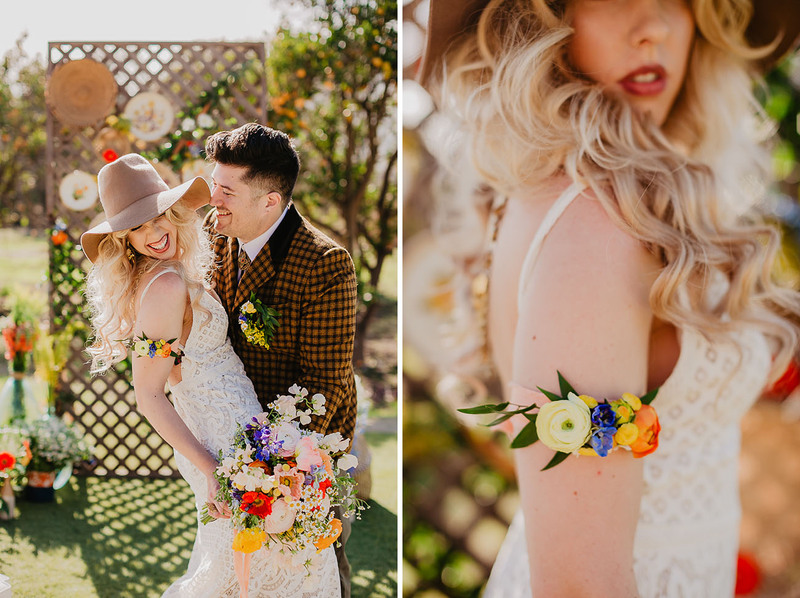 Okay, first of all — that circular boutonnière The Tangled Vine created is one of the COOLEST we’ve ever seen! 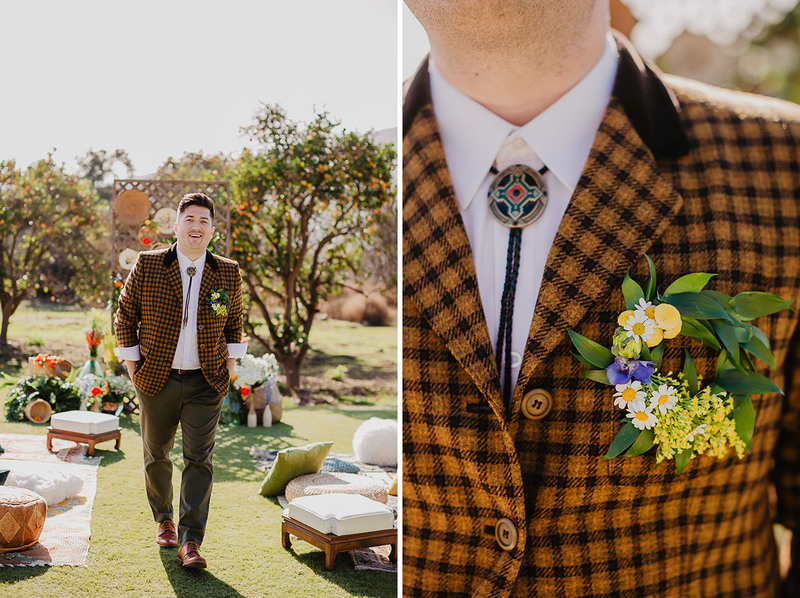 The groom’s attire was put together with pieces from Buffalo Exchange + Banana Republic, with shoes from Cole Haan. 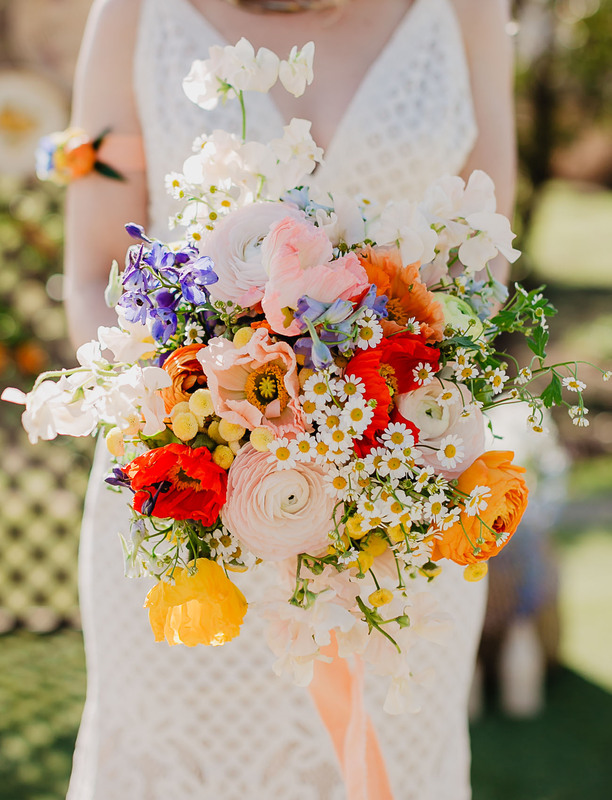 Yellow, pink and bright red poppies, along with orange ranunculus, darling daisies, and freesia rounded out this bouquet by The Tangled Vine. 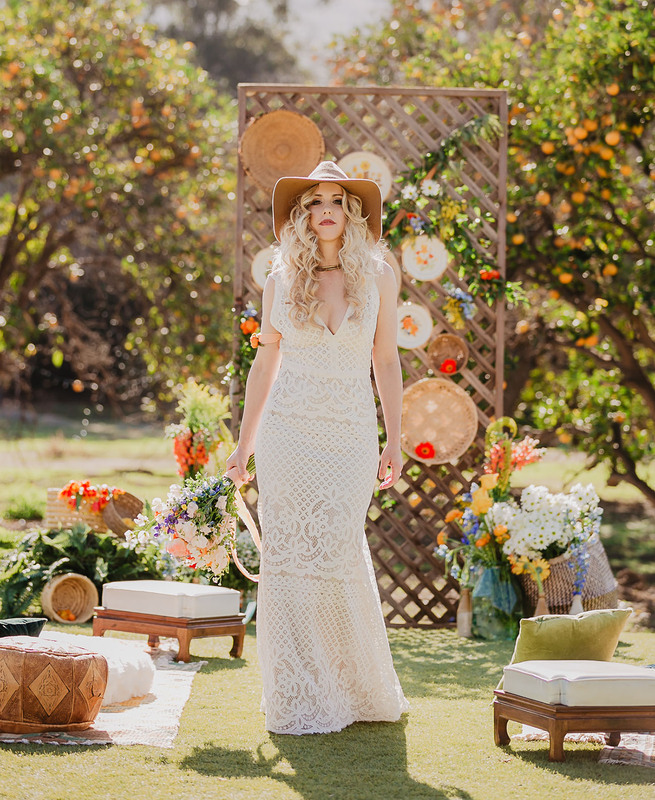 What better way to bring in the ’70s vibes than with flowing waves, à la Farrah Fawcett? Well done, Pure Beauty by Danielle! 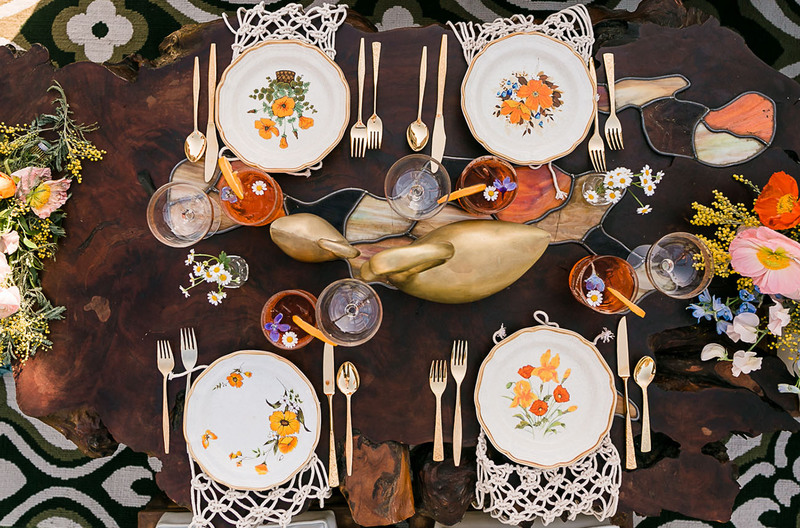 Yup, we told you those adorable floral plates would appear again! 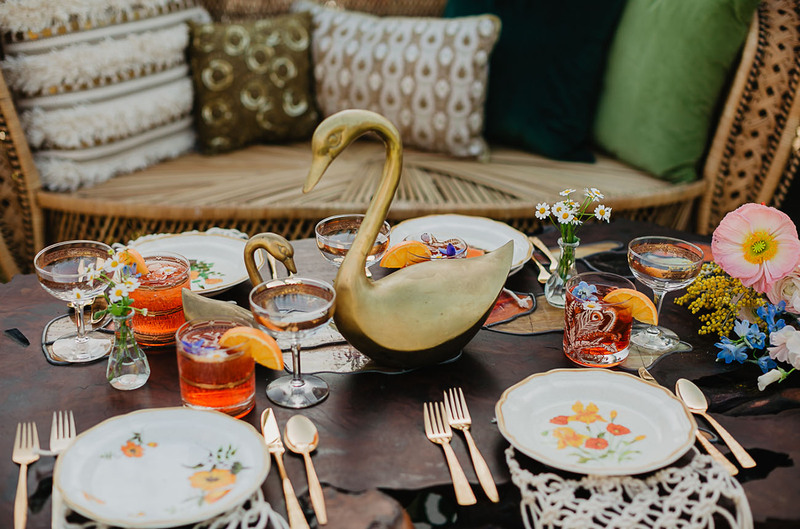 And how cute are they when paired with the macramé placemats? 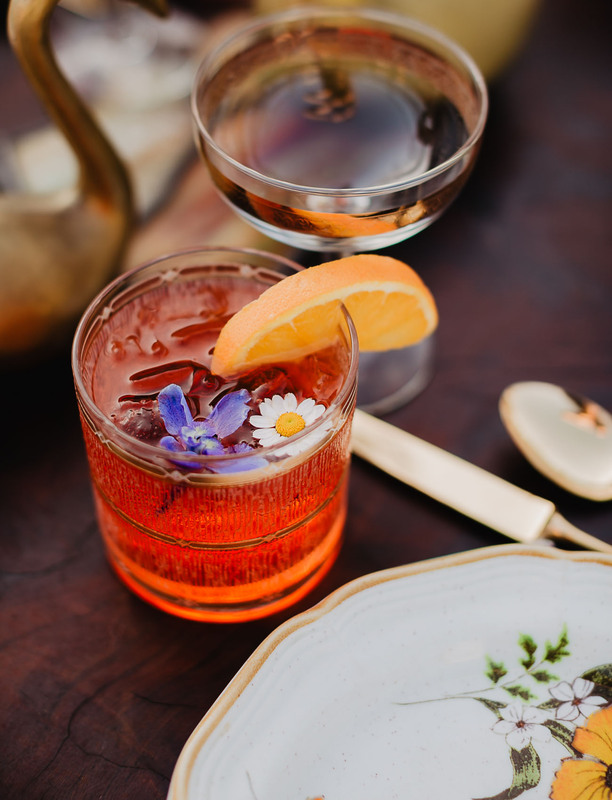 Floral cocktails are a personal fave of ours. Sundried Tomato Bistro played off the orange trees around the property for these delish drinks. 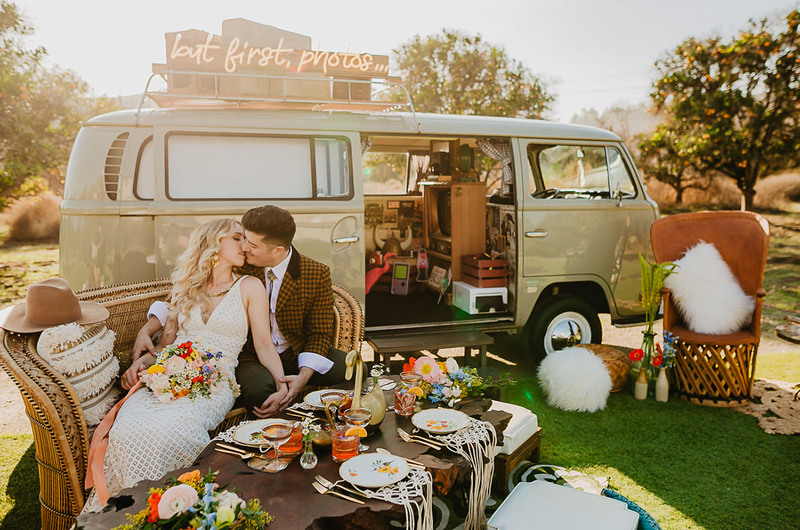 All you need is love… and a VW bus from The Booth & Bus Co.! 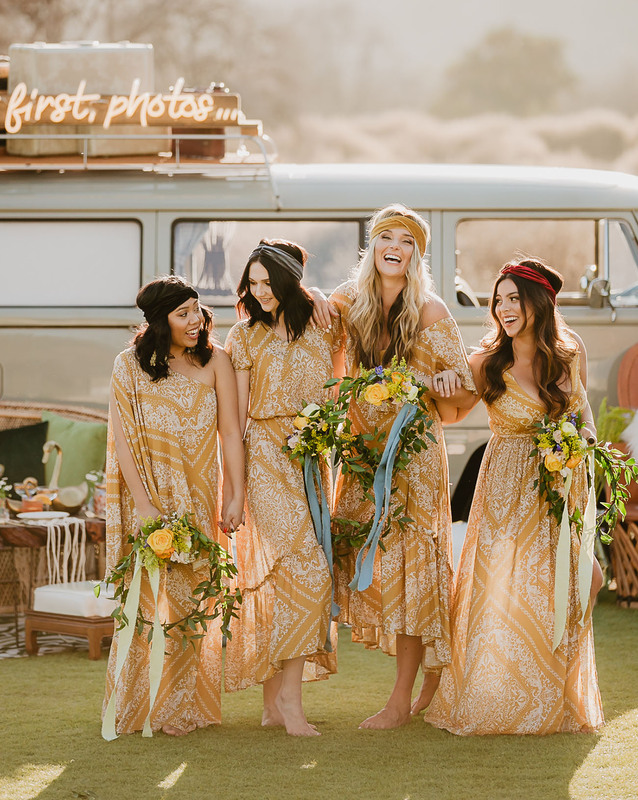 For a little extra retro flare, the girls rocked head wraps with loose waves for that extra beachy California vibe. 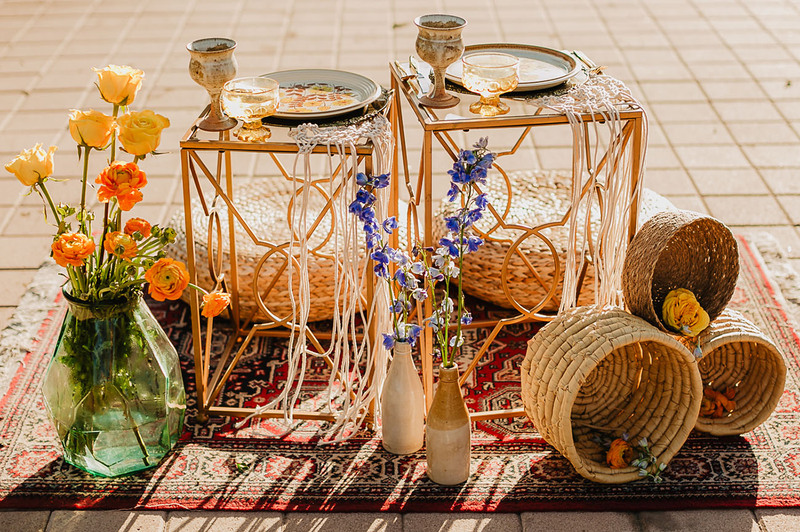 An eclectic mix of vases, wicker baskets, a vintage rug, macramé, goblets + floral plates… Yup, it feels like the ’70s to us! 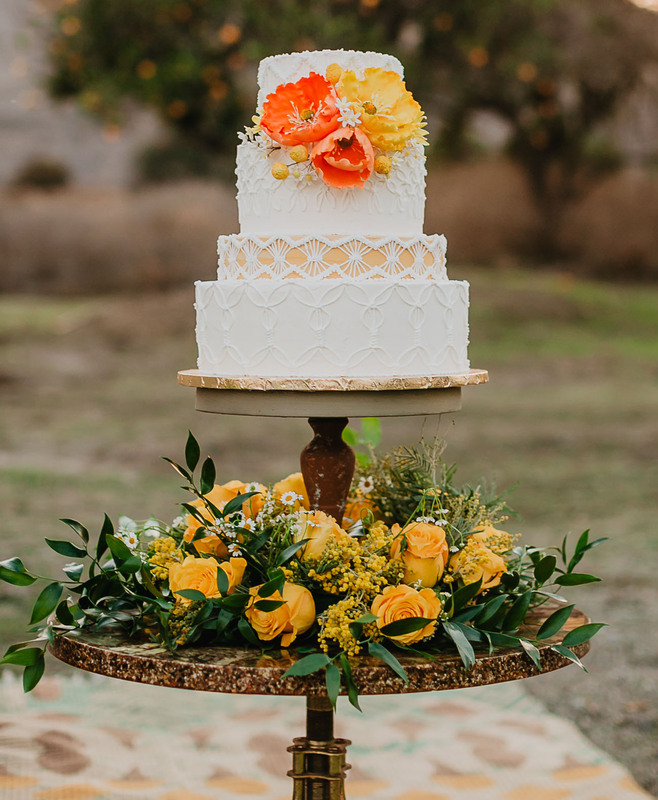 A macramé-inspired cake from Plumeria Cake Studio?! LOOOOOOOOVEEEE! 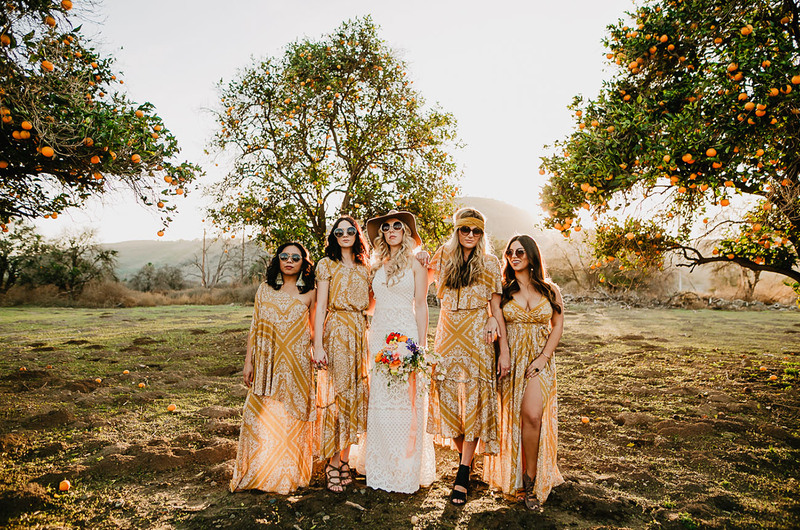 These Novella Royale dresses = PERFECTION! 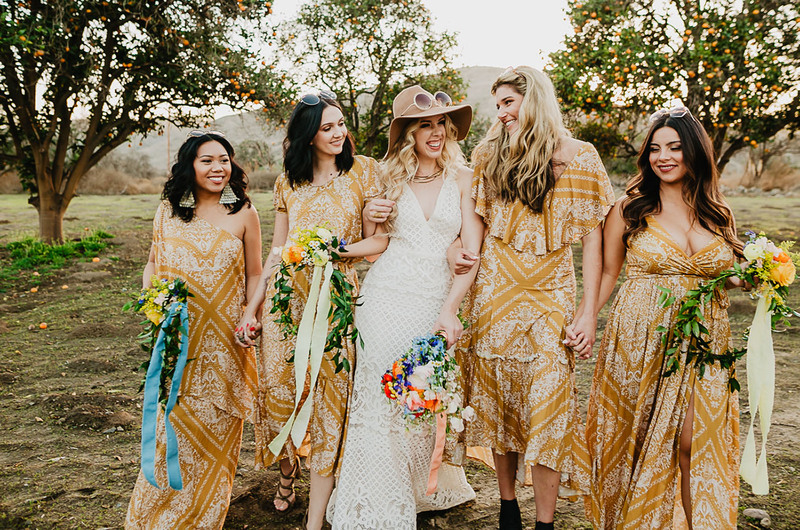 Mustard yellow hues, a paisley sort of pattern, and flowing silhouettes… it’s a yes from us! CHEERS TO THAT! 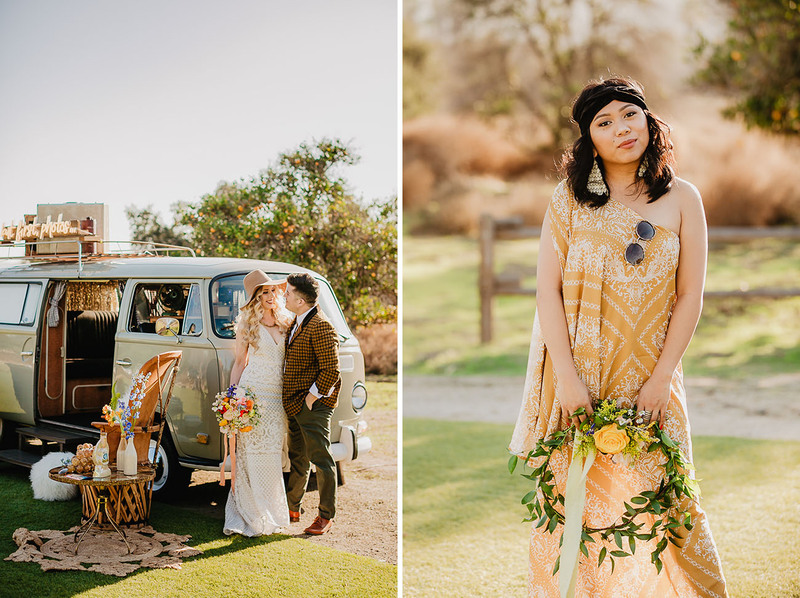 We’re all about the free-spirited vibes and golden hues from this ’70s-inspired editorial. Want to dive in deeper? Take a look at this sweet clip from Made By Blink. This photoshoot feels like it inspired Instagram to start. Gorgeous. Everything.